Our sales figures clearly indicate that (1) there is a significant market for beginning watercolor books, and (2) watercolor painters are especially interested in books on flowers. Factor in the great price and Sharon Hinckley's vivid watercolor paintings, and this book is a natural. 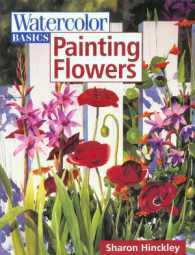 Painting Flowers gives beginners everything they need to get painting right away from basic exercises in color choice and composition to techniques for painting specific flowers and arrangements. Sharon Hinckley has had numerous one-woman shows and is represented in many private and corporate collections. Her work is featured in Splash 3 and The Best of Floral Painting. Hinckley lives in La Jolla, California.